The Wandering Albatross is a conglomeration of presentations with language-based expressions at heart, with the ultimate intent to bring new audiences to different ways of experiencing art than are usually on offer. 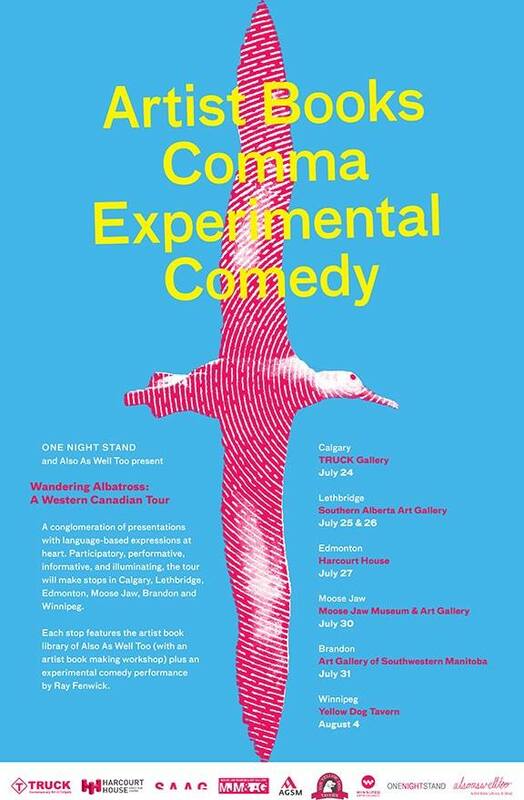 Participatory, performative, informative, and illuminating (collections), the tour will make stops in Calgary, Lethbridge, Edmonton, Moose Jaw, Brandon and Winnipeg. Winnipeg-based artist book library Also As Well Too will offer a display of artist books from their collection as well as facilitate workshops. Highlighting the indefinability that defines artist books, Also As Well Too will work with visitors to explore ideas about what makes an artist book an artist book, and encourage the creation of new titles. Additionally, Also As Well Too invites artists to submit collected works of artist books and their own creations to live in the Library’s collection in Winnipeg. At each stop, Ray Fenwick will offer part two of Le Moat Juice, a group of short, inter-related performance works somewhere between experimental comedy and performance art. The pieces that comprise Le Moat Juice focus with an absurd intensity on attempts to communicate with others, with one’s self and with the divine. If masterful communication can show us the heights of human potential, then Le Moat Juice can, haha idk etc etc. ONE NIGHT STAND is a nomadic exhibition series that works with a wide range of contemporary artists. Exhibitions are open to the public and are on display for one night only. Not having a fixed address allows ONE NIGHT STAND to disseminate contemporary art to the public in an experimental and improvised way. Also As Well Too is an artist book library based in Winnipeg MB. Ray Fenwick is an interdisciplinary artist working with video, performance, sound and typography. His work is an often-playful attempt to initiate alternative relationships with language and voice.